In this set of bundle, we have included 3 Expressions Lavender Slimming Oil and provide a free gift of 250g Himalayan Pink Fine Salt. This is a perfect combination used for body scrub purpose. It helps your body to be fully relaxed, enjoying in the Lavender Oil therapy yet at the same time, bringing you various health benefits. In 1930s and 40s, film stars use grapefruit and juniper berries as their beauty secrets for slimming. It is excellent for daily usage, day and night. 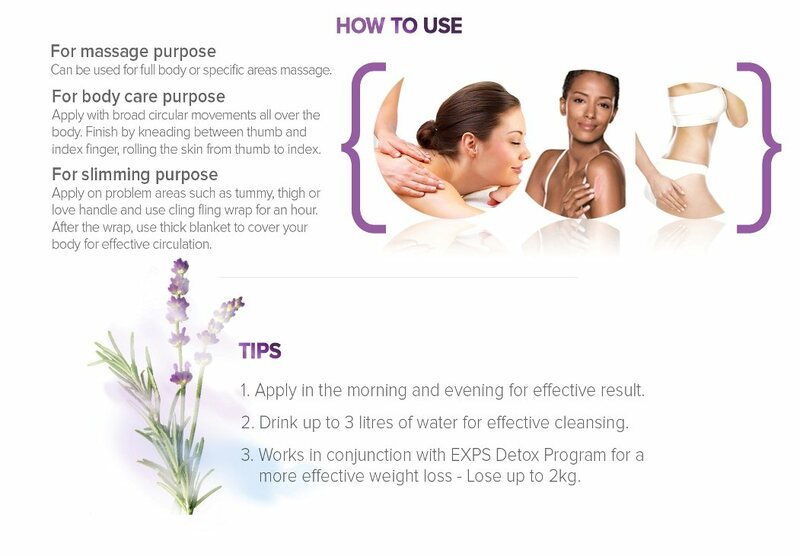 Expressions Lavender Slimming Oil helps to enhance blood circulation through deep-tissue massages and can be used in conjunction with thermal blanket treatments or any other slimming treatments. 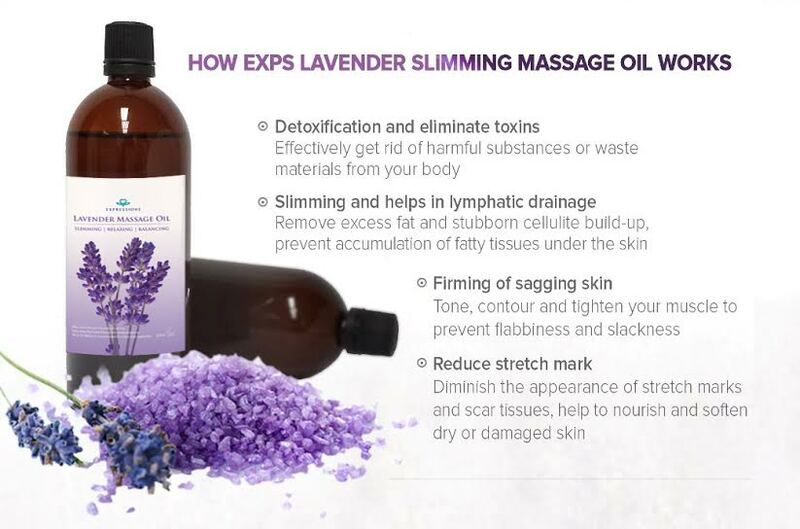 Expressions Lavender Massage Oil contains a very potent blend of natural fruit oils that helps to break down excess fat and stubborn cellulite build-up. This combination of oil acts as a diuretic which helps to minimize water retention in the body. The idea behind the salt scrub is that it helps to draw out the toxins, which typically store themselves within fatty tissue like cellulite. “Some toxins have to be physically removed, and worked out of the body,” Hubbard says. When rubbed on the body, the salt scrub helps to physically work the toxins out of the body; as toxins are removed with time, so is the cellulite. The Himalayan Pink Crystal Salt (Fine) can be combined with ~ 5 drops of our Lavender Slimming Oil to concoct a personal body scrub. Lightly scrub the skin with the concoction starting from the feet. Slowly work your way towards the head. Allow for the mixture it to stay for 5-10 mins while the skin absorbs the nutrients. Wash off with lukewarm water. You may repeat this process as often as you like. Expressions LAVENDER SLIMMING BUNDLE ready for you! We want you to have the best offer in Expressions. This bundle is specially prepared for you with Big sale and Free gift! 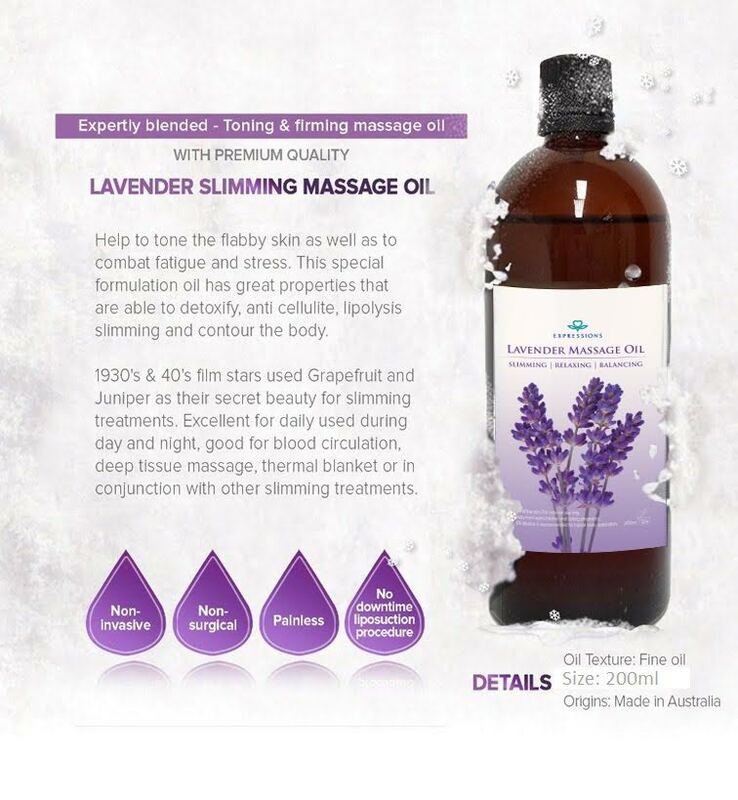 Get three Lavender Slimming Oil and get the FREE 250G Himalayan Salt! Himalayan Pink Salt is a pure, hand-mined, salt that is derived from accent sea salt deposits. It is the purest form of salt available on the market today, as it has over 84 minerals retained in its composure in addition to an abundant iron level. The himalayan Pink Salt is used by holistic chefs, healers, and therapists for its nutritional and therapeutic properties. Externally used, the Pink Himalayan salt stimulates circulation, activates deep relaxation, lower blood pressure, sooth muscular tensions, and actually detoxify impurities from the body. Himalayan Pink Salt has a rich mineral content that includes over 84 minerals and trace elements such as: calcium, magnesium, potassium, copper and iron. This salt is recognized for its beautiful pink color, high mineral content, and its therapeutic properties. Due to it’s therapeutic and nutritional properties, Himalayan Salt is used by holistic professionals around the world in healing, cooking, spa treatments, skin therapy and respiratory system treatments. It has a wide range of uses from stimulating circulation and helping to relieve signs of Allergies and Asthma, to treating Acne and other skin conditions such as Psoriasis, and is increasingly used by individuals worldwide in it’s culinary, bath and beauty and crystal lighting forms. 1. Shower and wash thoroughly before taking a detox bath. 2. Fill your tub with water that is about 98-100 degrees, just at or slightly above body temperature. This allows for maximum absorption and will also make you sweat. If you prefer hot baths, then enjoy it hot. You’ll still experience an effective detox. 3. Dissolve Himalayan salts in the tub as it’s filling. If your salts are chunky, you may need to let them sit overnight in a large pot of water to fully dissolve. If using essential oils, add them to the running water as your tub fills. 4. Soak in the tub for as long as feels comfortable, 40 minutes is generally recommended. 6. When you’re finished, drain the tub and get out slowly. Some weakness is to be expected. Some people recommend showering again after the detox bath, however it’s best to air dry, letting the mineral-rich water soak into your skin. *disclaimer – Results may vary base on the individuals.